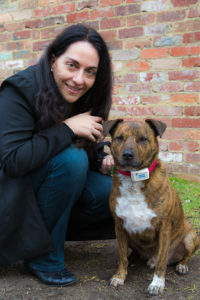 This week The Dogs of our Lives segment features Christina and her lovely little rescue Staffie mix Hoochie. How did Hoochie come into your life? I was following a rescue group in Sydney on Facebook and every week would see SOS messages going around with doggies on ‘death row’; those who would be euthanased shortly if they weren’t adopted. This caused me a great deal of distress, as I am an animal lover and long-time dog supporter. At the time I was dogless as I was still grieving the loss of my beautiful Bull Terrier X, Boris, some nine years before. I am not sure what happened the night I saw a picture of Smoochie as he was then called, but I knew I had to adopt him. 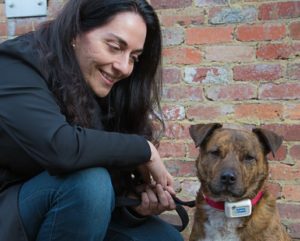 There were two dogs facing euthanasia the next morning – in less than 10 hours’ time – and I initially chose the female American Staffy, but she ended up being adopted by a lady in Queensland, leaving Smoochie the only dog in that pound facing death in the morning. When I was told that, I knew I had to have him. I paid the rescue group for him over the phone and they made the arrangements for him to go to the vet in the morning to be desexed and then put on the animal transport vehicle that would bring him to me in Melbourne. How did you know Hoochie was the dog for you? I didn’t! I just wanted to save a dog and have always been a fan of medium sized dogs. Hoochie was promoted by the rescue group as a Staffy X and while I think he does have a bit of English Staffy in him, I suspect he’d got more red heeler. He has beautiful colouring and I think of him as the tiger of the dog world! I would have been happy to adopt an older dog, but Hoochie was only about 12 months old, which appealed to my partner who wanted a younger dog. How have you helped Hoochie to adjust to his new life? He was such a wild dog when he arrived here! From the way he carried on when he was first put on a lead, I’m not sure that he had ever been walked. It would sometimes take a good 20 minutes to get him into his harness as he would roll around biting at it, determined he wasn’t going to be restrained in that device again. In the end I read about crate training and that made an enormous difference. I filled the crate with lovely blankets, toys and treats and Hoochie seemed to calm down a lot when he was in his special quiet place. I also retained the services of a dog trainer in an attempt to help Hoochie walk on the lead better. Slowly but surely he improved and today is wonderful on the lead, great in the house and an utter pleasure to be around. What are Hoochie’s two best qualities? His empathy and his affection. When I’m down, he knows about it and immediately seeks me out and comforts me. Hoochie had been with me for about 18 months when I suffered a devastating personal tragedy and lost someone who was very dear to me. During those first terrible months of grief he would barely leave my side. He’s also hugely affectionate and spends hours cuddling, enjoying tail scratches and spooning. I’m often surprised to hear a thud while I’m lying in bed, then I feel Hoochie quickly adopt the ‘little spoon’ position. He’s such a cuddle-bug. What advice would you give to someone looking to adopt a dog? Do it! Don’t buy from a pet shop and further the exploitation of animals born in horrendous puppy mills. There are so many wonderful dogs out there that need a good home and will repay your kindness with years of unconditional love. There is nothing like the devotion a rescue dog feels towards his or her ‘pawrents’.